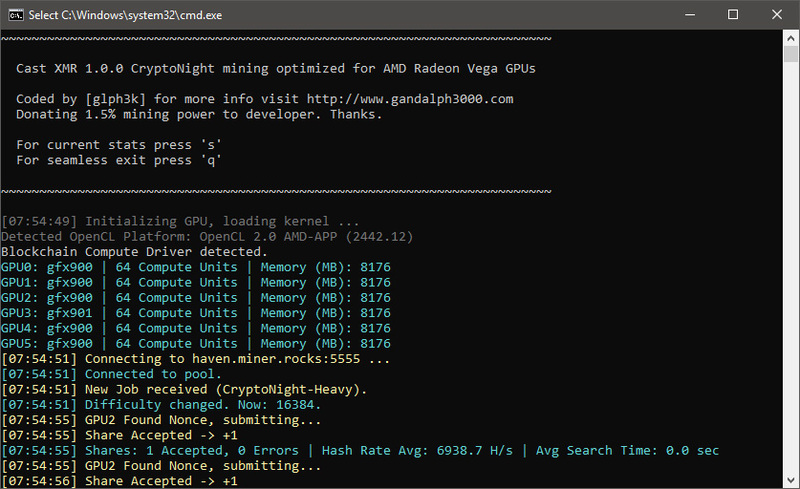 The Cast XMR CryptoNight GPU miner for AMD RX VEGA 56/64 GPUs has just been updated to version 0.9.5 with added support for the CryptoNight Heavy algorithm used by coins like Sumokoin (SUMO) and Haven (XHV). 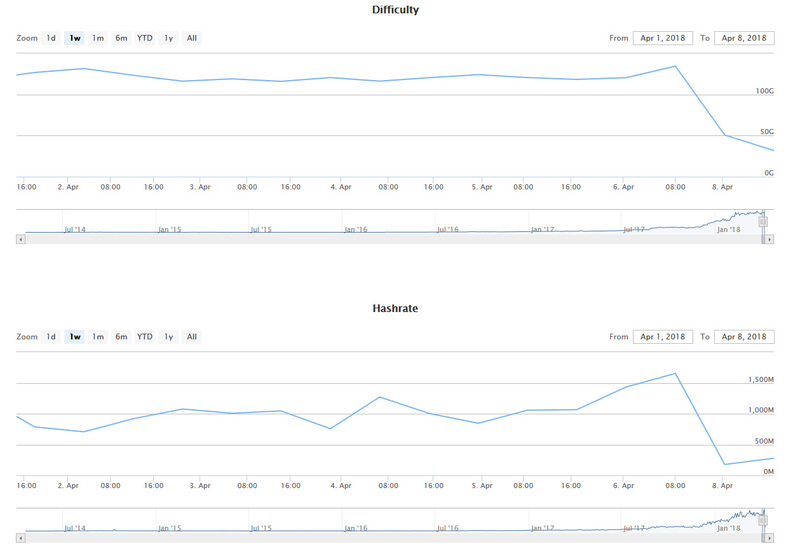 The new miner version comes with 0.5% performance improvement for the CryptoNightV7 kernel that it also supports. 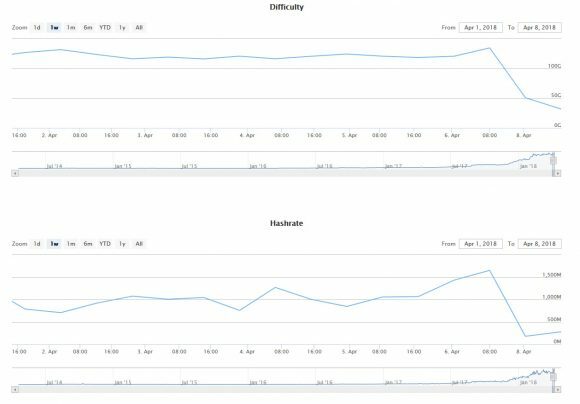 You can also use Cast XMR to mine the old CryptoNight algorithm, though now with ASIC miners available you probably wouldn’t want to do it. You can use the --algo command line option to set the desired algorithm: 0 for CryptoNight, 1 for CryptoNightV7 and 2 for CryptoNight Heavy. As a reminder, Cast XMR is a closed source miner and comes with 1.5% developer fee included as a means to support the further development of the miner. Nvidia GPU miners are also not forgotten and also have support for the new CryptonightV7 coins from the most popular miner out there that supports CUDA – KlausT’s ccminer-cryptonight fork. 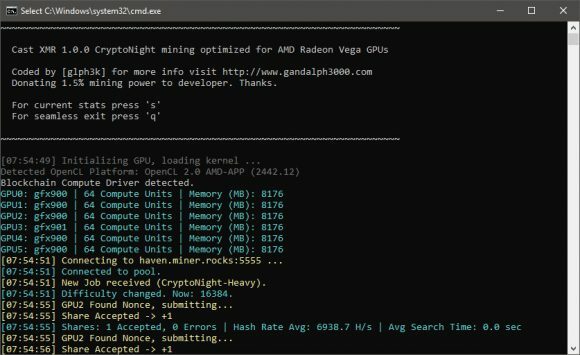 Nvidia GPUs however are as not as well performing compared to AMD GPUs, so the interest there for CryptoNight coins isn’t that big, but you never know when you can get a good profit even with Nvidia GPUS mining CryptoNight coins as well. With ccminer-cryptonight just make sure that you select the proper algorithm, depending on the coin you mine, the latest version adds support for cryptonight, monero, graft and stellite with the last one generating a lot of interest apparently. 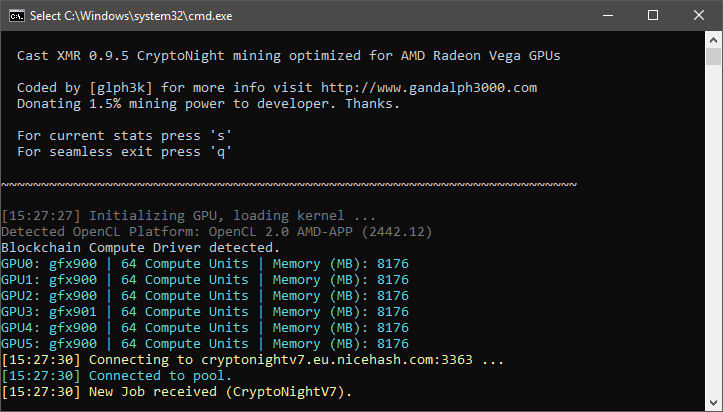 The latest NiceHash Excavator miner still in alpha also has added support for CryptoNightV7 (also included in the NiceHash Miner), so you might want to check it out as well if you are interested.